The small port town of Whitby on the Yorkshire coast both inspired and played host to the writer Bram Stoker as he worked on his great novel Dracula. Stoker was employed in London as manager of the Lyceum theatre and holidayed frequently in Whitby both before and after the writing of his most famous work. Macabre tales from the local fishermen are said to have had a great influence on Stoker and he chose to set part of the novel in the town. 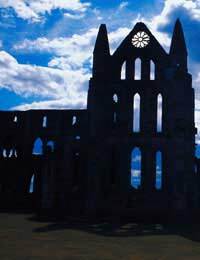 It was in Whitby in fact that Dracula first made his arrival on British shores, leaping in the form of a great black dog from the doomed ship Demeter as it crashed on the Whitby shoreline; it was here too that the character Lucy was seduced by Dracula and turned into a vampire herself. While living in Whitby, Stoker picked up several little snippets of knowledge which found their way into his novel. He heard of the Russian schooner Demetrius which, only a few years before, had foundered on the Whitby coast while bearing a cargo of coffins. Corpses in various states of decay washed up on the shore for some time to come. In the novel, Dracula himself travels to Britain on a Russian ship called Demeter which also bears a cargo of coffins. Today there is a memorial on the spot where Stoker is said to have received inspiration for this section of his novel. The name Dracula also came from what Stoker learned in the Whitby library while researching the history of vampirism. His intention originally had been to call the character Wampyr but, while reading in the library, he came across references to the Hungarian duke Vlad Tepes (also known as Dracula) who fought fiercely against the Turks in the 15th century and was renowned for his brutality. A hand-written footnote in the book said that Dracul meant “Devil” in Hungarian. Something in this seems to have tingled Stoker’s imagination and he changed the name of his character to Dracula. Modernity has arrived in Whitby as in everywhere else but its historical character has been rather well preserved, particularly in the cobblestone streets and winding passages of the Old Town. When darkness arrives, standing in certain spots, it is easy to imagine oneself transported back to the nineteenth century and to recapture the sense of foreboding and of vulnerability which led Stoker to choose this location for the scene of Dracula’s arrival on British shores. Whitby has certainly made the most of its dark heritage. Almost every shop and establishment you can think of now boasts some Dracula association. The tourism trade has replaced the fishing industry as the economic mainstay of the town. Among the most compelling of the attractions offered are the Dracula Experience, which retells the classic story through a mixture of music, animation and live actors’ performance; and the Dracula walks which offer a tour of all the Dracula-related spots in the town together with helpful commentary from a local guide. Whitby also has a genuine haunted history as well as a fictional one and another walking tour is available which will give you some insight into the legions of local ghosts. Nestled against the North Sea, Whitby has managed to preserve much of its “olde worlde” charm and today can certainly provide the basis for a pleasant excursion for anyone with an interest in the paranormal or in literary gothic.